Many of us living in the Reno-Tahoe area have a deep-seeded sense of pride about where we live. We love the outdoors, the climate, the mountains, the river, the restaurants, the art, the culture, the people, well, everything. But Reno wasn’t always such an art and culture mecca. 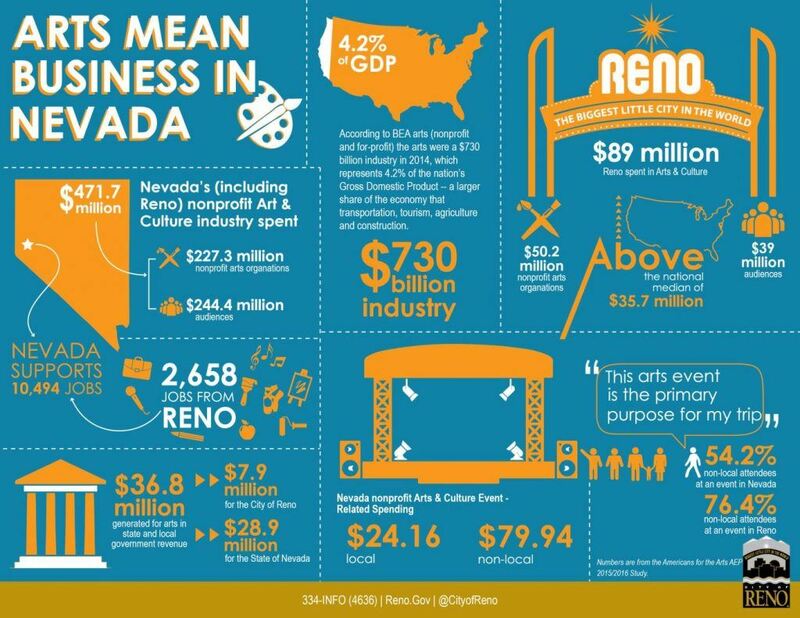 Reno embracing arts and culture was a purposeful plan to market our city. The strategic plan adopted by the Reno City Council in 2016 envisions the City of Reno as a community renowned for arts and culture. Our leaders see that a thriving downtown and university district as well as vibrant neighborhoods and public places are intrinsically related to a vibrant arts and culture scene. And that a vibrant arts and culture environment is intrinsic to a thriving community. There hasn’t been a better or more exciting time to be involved in — and to support — arts and culture in our community. People want to live in places where there is a thriving and energetic community. The burning man art, the murals, the cultural events, these are all things that make us unique and draw people in, as well as instill even more pride in our current community. We are a city that embraces art! If you are interested in learning more from the City of Reno about how the arts and culture program and how it makes Reno THE place to be, join us for our next marketing luncheon on October 17th!